Noah’s Ark is probably the earliest known example of preference-based immigration system. The existing regulatory framework of our own employment immigration laws doesn’t deviate from this enduring template. Similar to family immigrants, all employment immigrants fall into preference categories, which are based on the nature of permanent employment, its requirements, and the employment and educational qualifications of intending immigrants. However, unlike family immigrants, some of whom are exempt from per country admission quotas, all employment based immigrants are subject to quotas, which have not been adjusted for decades and are hopelessly out of sync with the current employment immigration levels. It can be argued that the existing system creates reverse discrimination and unwarranted preferences while claiming to redress imbalances due to disproportionate representation. 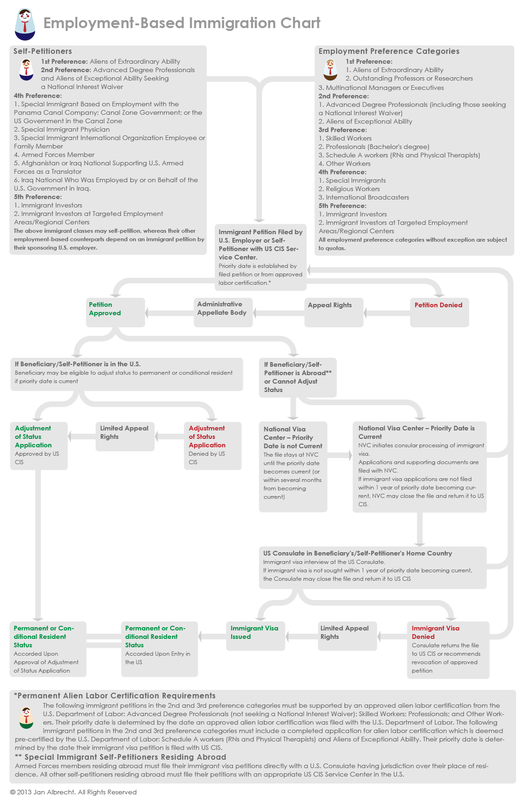 The following chart illustrates the basics of the petition process for employment immigrants.